Through our partners at the Australia Sports Foundation, we are able to offer a tax deductible donation program to everyone wanting to support grassroots Judo in NSW. Our new program is aimed at improving the club level marketing capability, knowledge and capacity in order to attract new participants to the sport. 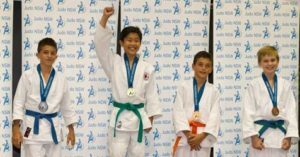 We are aiming to increase the number of Judokas (people who do judo) in NSW by 15% per annum over a 4 year period, or an extra 1300 members. permanently improving judoka recruitment skills at coach and administrator level. It is my great pleasure to invite you to provide feedback on the Judo for Life bequest program, a new program being developed for Judo supporters who have chosen to leave a gift in their Will to Judo NSW. Judo NSW is committed to ensuring any money donated will be spent for either individual development, club development, or for the general development of the sport of Judo in NSW – exactly as you determine. I’d really value your opinion on this new program – if there is a way we can improve it, please let me know.